(Newser) – A St. Louis grand jury has indicted Missouri Gov. 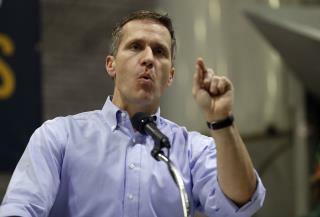 Eric Greitens on a felony invasion of privacy charge for allegedly taking a compromising photo of a woman with whom he had an affair in 2015, the city circuit attorney's office said Thursday. St. Louis Circuit Attorney Kim Gardner launched an investigation in January after Greitens admitted to an affair with his St. Louis hairdresser that began in March 2015. He was elected governor in November 2016. Gardner declined comment beyond a brief news release, but spokeswoman Susan Ryan confirmed the indictment stemmed from a photo Greitens allegedly took of the woman, the AP reports. Greitens was taken into custody in St. Louis and released on his own recognizance, Ryan said. I see a lot have the same TDS talking point. Well here's Mine... These are the sexual-assault allegations against Bill Clinton~ businessinsider.com. & Hillary & other Feminists saved the 42nd president of the United States in the 1990s. They were on the wrong side of history~TheAtlantic.com Interesting ain't it to this day. Flush him and her as possible set up. What's outrageous is that we have psychos like Clinton, Cosby, Obama, both Buish's, Reagan, Carter, Ford, Nixon (regardless of watergate) and Johnson that have avoided accountability. Look at Clinton and Cosby: https://ijr.com/2016/10/714068-trumps-accusers-are-believed-by-democrats-so-here-is-a-full-list-of-every-one-of-bill-clintons-alleged-sexual-victims/?utm_campaign=conservative-daily&utm_medium=owned&utm_source=email https://heavy.com/news/2015/10/bill-cosby-how-many-sexual-assault-accusers-victims-list-names-photos-lawsuit-allegations-pictures-interview-accusations-claims-ages-dates/ Don't have time now to link criminal behavior of others on above list .